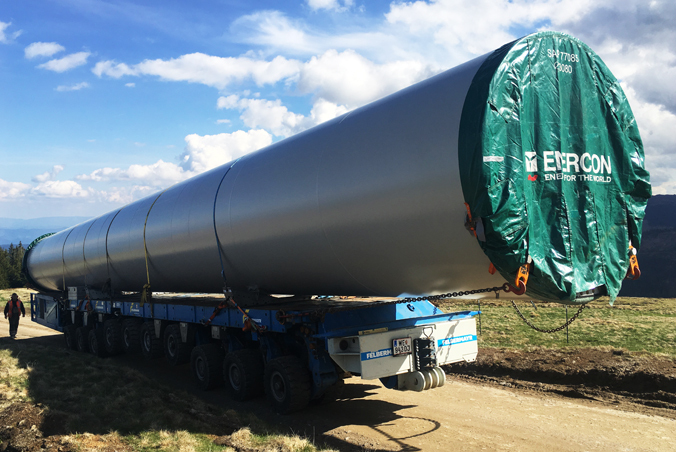 Recently, a wind turbine blade transport assignment was carried out at high altitude by long-time customer Felbermayr using Scheuerle's rotor blade transporter. For the large-scale wind farm project on the Handalm mountain, close to the border to the Federal State of Kärnten, 13 wind turbines are currently being erected at a height of around 1,800 metres which will supply green electricity to more than 21,000 households by the end of 2017. This project is bigger than all previous wind parks in the south of Austria. Along with the actual construction itself, transport operations also faced tremendous challenges. With gradients of up to 20%, the wind turbine blades weighing 8 tonnes were transported with the aid of Scheuerle rotor blade adapters. The corresponding tower segments for the wind power station were moved by the reliable Scheuerle SPMT.